How about combining 2 holidays in one? 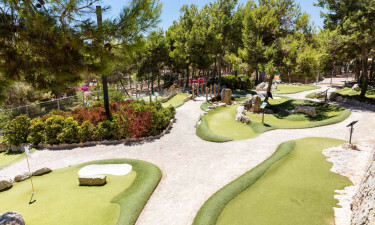 Situated just 5km from the long sandy beaches of the Costa Dorada and with Barcelona and Tarragona a short bus ride away, enjoy a fun-packed camping holiday and exciting city break at this fabulous site! 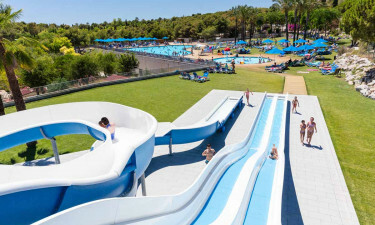 Welcome to Camping Vilanova Park! 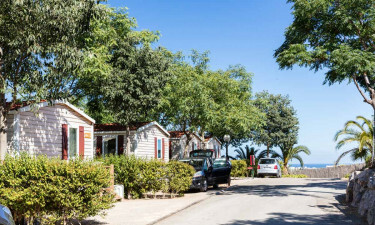 A green and spacious luxury camping site with superb facilities and attractions for the whole family, this haven is nestled amongst the idyllic pine and palm trees, LuxCamp’s modern mobile homes ensure your stay is a comfortable and pleasant one. Surrounded by the lush greenery of the landscaped lawns, the pool complex is the beating heart of the park. Toddlers can splash around safely in one of the children’s pools, whilst the terraced outdoor pools with sun-loungers are ideal for basking in the sun and cooling off. Visit the spa centre with it heated indoor pool (extra charge € 5 per person from 4 years onwards), Jacuzzi, sauna and wellness treatments for a total luxury camping experience. Keep up with your training at the gym, or maximise your time in the sun with a game of tennis, football, volleyball, boules or mini-golf. A playground and huge jumping pillow will keep the kids happy and there are additional daytime and evening entertainments for the whole family. Bicycles are available for hire, as well as a shuttle service to the beach. Fancy a break from the beach or pool? There are many wonderful coastal towns and cities to visit on this part of the Catalan coast. 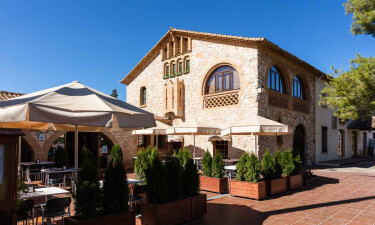 Right on your doorstep, Vilanova i la Geltru has a beautiful old town, one of Catalonia’s longest Ramblas, an award-winning marina and a plentiful number of excellent restaurants, bars, cafés and nightspots. Just up the road, the chic town of Sitges, often referred to as the Saint Tropez of Catalonia, is well worth visiting for its boutiques, restaurants and nightlife. Barcelona needs no introduction and should not be missed. In the other direction, the medieval city of Tarragona is famous for its splendid Roman ruins. Take a walk along the ramparts of the walled old town for a spectacular view of the city. A charming old stone farmhouse with a terrace has been converted into a restaurant and bar. Takeaway is also available on-site. A well-stocked supermarket with a bakery caters to all your immediate needs and there is also a gift shop. Vilanova has 5 sandy beaches stretching over 3.5km that are not only great for sunbathing and swimming; local operators offer diving, kayaking, surfing, sailing and horse riding too. The beautiful Parc Natural del Garraf covers an area of 12,820 hectares and is home to a rich variety of protected plant and wildlife. Exploring the park with its marvellously pure air on one of the many trails, either by foot or bike, will leave you feeling energised and rejuvenated.